Groupon.com is offering a great online deal for a subscription to Canadian Gardening magazine for just $10. There is a limit of 1 voucher per order, but you may buy 5 additional as gifts. Not valid until July 29th 2012. Voucher expires on December 26th 2012. This offer is online only. The price listed for a 1 year subscription direct from Canadian Gardening is $24.95 and that is discounted, so $10 is an awesome deal. I am a big fan of Canadian Gardening as they have everything you ever wanted to know about gardening and then some. They have had issues with great ideas for planning outdoor events as well as many fantastic recipes. 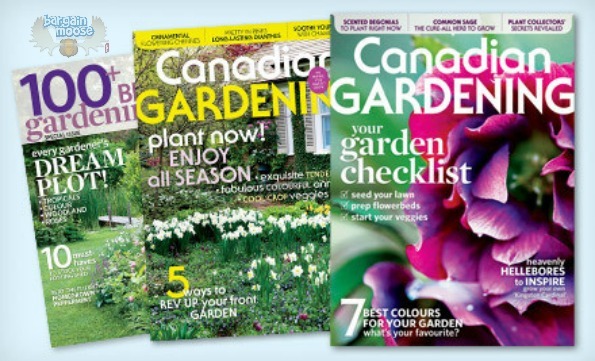 Visit Canadian Gardening to see all the information offered in their magazines. I found great tips in there for preserving as well as what to do with certain weeds instead of trying to get rid of them. There are also some great arts and crafts that can be made with plants etc. For those of you who love to garden, or just dabble with a couple of house plants, it's great entertainment and a ton of good knowledge. Shipping: Extra $5.95 fee for shipping and taxes.